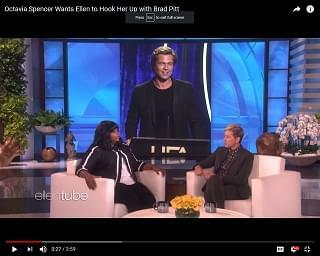 It’s no secret that Octavia Spencer has a thing for Brad Pitt. Now that he’s single, she wants Ellen DeGeneres to hook it up. During Spencer’s appearance on The Ellen DeGeneres Show yesterday, she said that she and the soon-to-be ex-Mr. Angelina Jolie were attending the 2018 Hollywood Film Awards on Sunday. She saw him and squeezed him. At that point, “His face lit up and then security whisked him away,” she said. Octavia told Ellen, “You can hook me up with Brad.” We’re guessing Mrs. Portia deRossi doesn’t have the juice to do that because she offered up Idris Elba instead. While Octavia wasn’t opposed to hooking up with this year’s Sexiest Man Alive, she said, “I think he’s taken.” That’s a fact because he’s been engaged to Sabrina Dhowre since February. ONE MORE THING! Octavia is getting ready for her next thing – whether it be a man or a role – by training with Mark Wahlberg. She and her “Instant Family” co-star have working out and documenting it on The ‘Gram. Check them out HERE.